Between the continuous stream of political, humanitarian, economic and diplomatic firestorms set by the Trump administration and the actual forest fires here, it’s been a long, hard, hot summer in California and much more stressful than summer should be. I water cautiously, keep moving forward, and try to keep my family healthy and myself from letting it take over. I’m also looking for an effective civil rights and humanitarian aid group to contribute to–the Southern Poverty Law Center is one; there are also several mothers’ groups raising funds for legal representation for immigrants separated from their children. As I discovered last year during hurricanes Harvey and Maria, making donations for humanitarian aid is an important way to help yourself as well–it’s something concrete you can do that will actually make a difference, and it makes you feel less overwhelmed and powerless as an individual. Whenever I step back from the newspapers for a bit, though, I look around me and see the brighter side. I consider that my daughter has finished high school with both honors and friends, and for a change doesn’t have summer homework. She’s working in a job she loves, is learning to drive and is nearly on her way to college, which we are all looking forward to. She’s ready and I’m proud of her (although I’m still not quite ready to see Ladybird). I’m working for a community book festival this fall that promises some fun and challenging authors, I have some interesting new freelance assignments, and my first e-book project is nearly ready for publication. And I’ve started experimenting again in the kitchen–something I really didn’t have the time or concentration for during graduation and its immediate aftermath. The heat wave is a big factor in my cooking; Pasadena tends to get over 90 F most days of summer (and plenty of times from September to April too), and the past few weeks have seen temperatures in the 100s midday. So the freezer and microwave are essentials in my book. So is eating or preserving enough of the bounty of summer produce while it’s at its best to keep it from going to waste even in the fridge. Because I always tend to go overboard at the greengrocer’s–last year or the year before it was nectarines (this year too). This year it’s plums, strawberries, any other berries I can get at a good price. Most berries are good if you just wash and freeze them while they’re still in decent shape. Mix three or so ounces of frozen blueberries or blackberries with a 4-ounce/half-cup dollop of plain nonfat Greek yogurt and a teaspoon of sugar in a small plastic cup or snaplock container (the plastic is a better insulator than ceramic cups or glass) and you have nearly instant all-real and nicely purple frogurt–the small berries get the yogurt freezing the right way, right in the cup, within about 30 seconds as you stir. But what if the berries are going a bit ugly and soft–like strawberries? There’s nearly no point in trying for homemade strawberry frogurt or ice cream unless you really personally like it. Sorbet, I can definitely see, but for my money, strawberry ice cream is generally an insultingly pale pink, not terribly fresh, and tastes duller than plain vanilla. It would be a lot better to stick some actual fresh strawberries or a not-too-sweet fresh strawberry purée on the side of some good-quality plain vanilla because you’d have a real contrast between two actual flavors, not one mediocre pink in-between. Strawberries are one of my favorite fruits—fresh and raw or else frozen, unsweetened. But I actively dislike most strawberry jam—the cooked, oversweetened blandness bears no resemblance to the fresh, tart wild-tasting fruit I love. 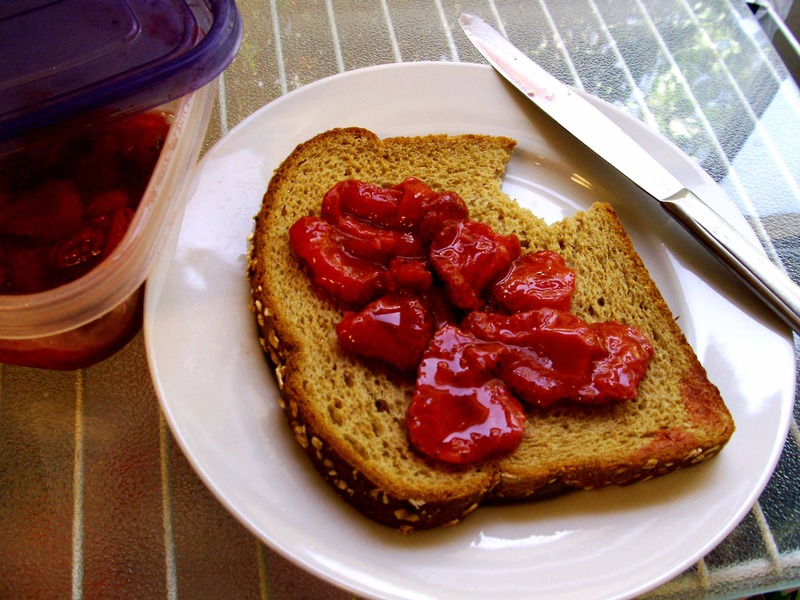 Commercial strawberry jam is not only unbearably sticky-sweet and gluey but the fruit itself, when you encounter it, is usually a slimy dull gray lumpette with five o’clock shadow, something to pick out cautiously rather than savor. It’s not the best of the fruit to start with, and it’s now overcooked and showing it. But there are still some really heavenly strawberries out there going overripe on the market produce shelves, and I had about half a pound left just a little too long in my fridge after a party. I discovered by fooling around that strawberry jam or at least compote that still tastes like strawberries is possible to do at home if you microwave it lightly instead of cooking it to death. And I even liked it. Could I keep the tartness intact? Could I keep it lightly cooked enough to still taste fresh and like strawberries to me? Could I keep it from being slimy? Back at the beginning of Chanukah in mid-December, I was too busy to do much celebrating or posting. We were traveling more than usual and my daughter’s college application essays were still in rough shape and we were both a little panicked. My poor husband was working 13-hour days and trying to calm down the younger post-docs that this wasn’t ALWAYS how R&D goes–just sometimes. It’s the price you pay for doing rocket science. And it was pretty hot and dry around Los Angeles–hence all those fires in the news. Makes it hard to feel safe breathing. Still, we did manage to celebrate modestly, even though the first night of Chanukah was during the nailbiter Alabama special election, whose results wouldn’t be in until after supper. I don’t do deep frying for Chanukah, particularly not with olive oil, which is expensive and wastes the oil and the calories (gotta save a few for the gelt–chocolate coins). And the cleanup. As my forebears did, I want to make a little olive oil last a longer time by using it sparingly with foods that deliver a slightly better svelte potential than potato latkes. Well–most of my forebears were more worried about getting enough food during the winter, not about eating too much, but let’s say my parents, who grew up in America with enough potatoes and enough oil to give you a gallbladder (and if that’s not a Jewish expression, I don’t know what is). In any case, frugality is warranted but so is enjoyment. How to balance the two? I’m in love with gilded cauliflower–I think I’ve mentioned it a few (hundred) times. It’s quicker to prepare and probably even somewhat cheaper in salad bowl volumes than pasta or potato salad most of the year. Certainly more nutritious and sophisticated. And it contains garlic. I recently reinforced that view with my entire congregation when I brought a Sicilian (Roman? don’t exactly know) roasted cauliflower, pepper and artichoke salad to a brunch buffet after services. I was pleasantly surprised that by the end of the meal most of it was eaten and actually complimented on. I know, that’s not a true indicator in a lot of places, but Jews aren’t generally shy about telling each other what they really think, especially my congregation, and especially about food. But I wasn’t totally in the mood for more of the same, even though I had about a third of a big head of cauliflower and some marinated artichokes left over from a frittata. Somewhere in the depths of my grains-and-beans drawer in the fridge (most people use it as a meat drawer; I use it to foil moths) I had stashed a bag of chickpea flour (Bob’s Red Mill; about $2-3 for a 16-ounce bag) because I thought I might make felafel (microwaved and pan-browned, still not deep-fried). But that seemed like a bit of work and kind of heavy. When I went to pick up my daughter from school, I still hadn’t quite figured out how or what I was going to do quickly but semi-festively on a weeknight with homework and college applications looming. I knew I wasn’t even going to bother wrapping the presents I had for her and my husband, and I had to scrounge for enough candles to light the first night’s lights (note to self, get an extra box, one for next year). As we passed a new Indian restaurant on the way home, though, it finally clicked. “How about if I tried making some cauliflower pakoras?” I asked. This is what happens when I get to the corner grocery or (more occasionally) the farmer’s market at the end of the day: I’ve already got a basket full of stuff, ripe, bursting with aromas it would take most supermarket produce days, weeks or forever to achieve. But there in the last-chance corner is a bag of very pale green, very contorted Hungarian peppers, about 10-15 of them for a last-chance dollar. They’re in good shape, maybe one or two has a couple of minor wrinkles, but that’s it. I can’t resist. At first I thought I’d use them to stuff with corn kernels and feta and scallions, which I haven’t done for a while. But when I got them home, they were obviously too twisted to stuff, and very thin-walled at that. And unlike Anaheim or pasilla chiles, not really spicy enough to set off the corn. What then? I’ve been feeling my nonexistent Italian and Greek roots lately, so I thought, pepperoncini? Well, why not? I did pickled green tomatoes last year, and it was incredibly easy (except for finding the green unripe tomatoes, which even my local Armenian corner store doesn’t provide often, and especially not at the height of the summer Fresno tomato frenzy). But I didn’t want to wait two whole days for the peppers to ferment. And I didn’t want them quite as salty as actual pickles. 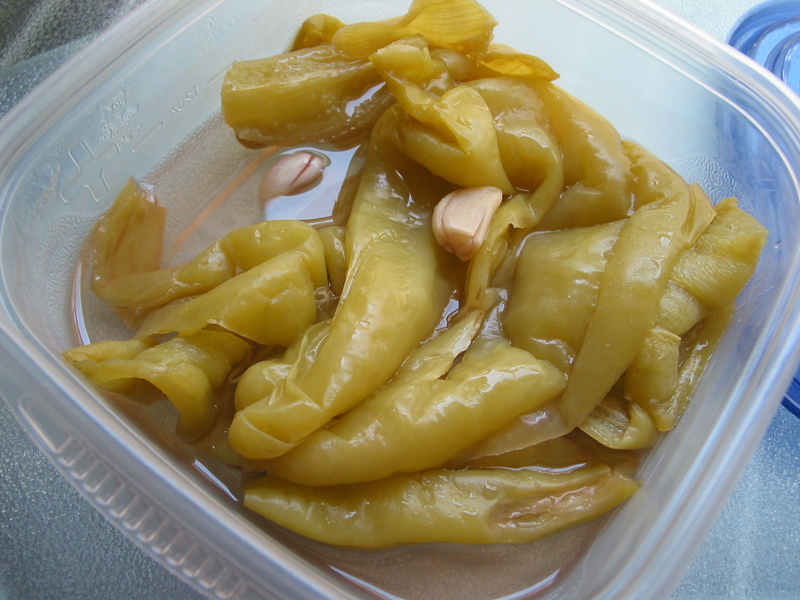 So I decided to microwave-marinate them the way I make marinated artichoke hearts. Yes, you can always just buy a jar of pepperoncini. My greengrocer definitely has them. But if you have the fresh peppers and they’re dirt cheap and you just want them right now, not necessarily every day for the next three months, microwaving them takes all of five minutes, and the result is surprisingly good. About a week ago, my husband and I decided we were finally grown up enough to take ourselves out to a movie (and leave our slightly attitudinal teenager home to watch some sort of awful teen tv series without us). We’d heard from friends about a documentary called Deli Man that was showing at reasonable hours downtown, and it sounded not bad. We found parking at the bookstore next to the theater, ignored most of the threatening new signs about being towed if we didn’t shop the bookstore and get back out within 90 minutes (it was a Sunday evening, and the bookstore was closing early), and walked into a sparsely attended theater. Which (the sparseness, I mean) was a shame for the theater and everybody who wasn’t there more than it was for us, because Deli Man is terrific. You’ll laugh, you’ll cry, you’ll wonder what a Cordon Bleu-trained chef is doing in Houston kibbitzing with his customers in a strip mall deli while sweating the details behind the counter and agonizing over the memory of his grandfather’s idyllic but lost gravy recipe as he serves up gargantuan matzah balls, stuffed chops, and sandwiches you need to be a python to get your jaws around. Cue Jerry Stiller, Fyvush Finkel, Larry King and other New Yawk old-timers, the local Jewish community fans in Houston, and some of the best–and hopefully not last–deli men in the business. In between the semi-humorous profile of David “Ziggy” Gruber, third-generation deli man and one of the last under 50, plus (of course) all the kibbitzing from family and friends who wonder when and if he’s ever going to be marriage material, you get interviews with the old hands who themselves are sons and grandsons of the original great deli owners. Sarge’s, 2nd Avenue Deli, Stage Deli, Carnegie Deli, Ben’s Best–most of the guys who are still in business and some who aren’t. They’re famous, they’re well-established, they dress nice…they’re still working backbreaking hours themselves and pushing their kids to get out and go to law school or into engineering because it’s such a hands-on business and training juniors with the right attitude is so difficult. And attitude is what counts. David Sax (Save the Deli), Jane Ziegelman (97 Orchard) and Michael Wex (Born to Kvetch and Just Say Nu) trace the roots of the deli through the waves of Jewish immigration on the Lower East Side, the move to Jewish-style as opposed to kosher, and the decline in our times of a great old-neighborhood tradition as the old urban neighborhoods changed hands and Jews struck out for the suburbs. You get a chillingly clear picture of why the number of Jewish delis has shrunk from thousands in New York alone after WWII to only about 150 nationwide today. At the same time you see why the deli guys hang in there–and so do their customers. Jewish delis, kosher or not, are not the usual kind of American casual restaurant. They’re extremely personal and familial, as Jews still tend to be with each other. The old-style Jewish waiters would argue a lot; sometimes they’d tell you rather than ask what you were going to eat, and it became a classic shtick. But as Gruber pointed out on Alan Colmes’ Fox News Radio interview (and no, I can’t believe I’m providing a link to anything Fox either, but it was a good interview), the days of the cranky waiter are more or less gone. And on the other hand, delis still deliver more for the money than the nouveau-hip places with $50 plates and $18 drinkies. The regular customers expect more–not necessarily more food (though that’s an impression you might get from the outsized portions), but for the deli owners and waiters to know them, talk with them, argue even–and remember exactly how they like their food. That kind of personal is what makes the give and take between kvetchy customers and ebullient owners work so well and it adds ta’am, flavor, to the whole experience of going to a deli. They know you, and they pay attention whether you’re a CEO or an average Joe. You can’t get that in a chain restaurant; you don’t get it at a three-star haute palace. Delis have also, at their best, been the kinds of places where seemingly hard-nosed owners were known to sustain their neighborhoods in hard times, sometimes secretly comping a free meal if a customer was out of work. Deli Man is deliberately and intelligently personal even as it traces the history, the economics, the fans among the Broadway stars, and the paradoxical Americanness of the Jewish deli. There are plenty of old black-and-white vintage photos, a bittersweet tour of the Lower East Side and its remnants, and klezmer music from one of the modern greats. Far from becoming a Ken Burns wannabe, though, it’s funny, wry, well-paced, modern–and most of all, it gets to the heart of what makes a deli matter. From start to finish, this is a documentary that cuts the mustard. In fact, my only serious kvetch is this: too much pastrami, not enough corned beef. Two large tilapia fillets pan-fried with a hummus, tehina and yogurt coating. 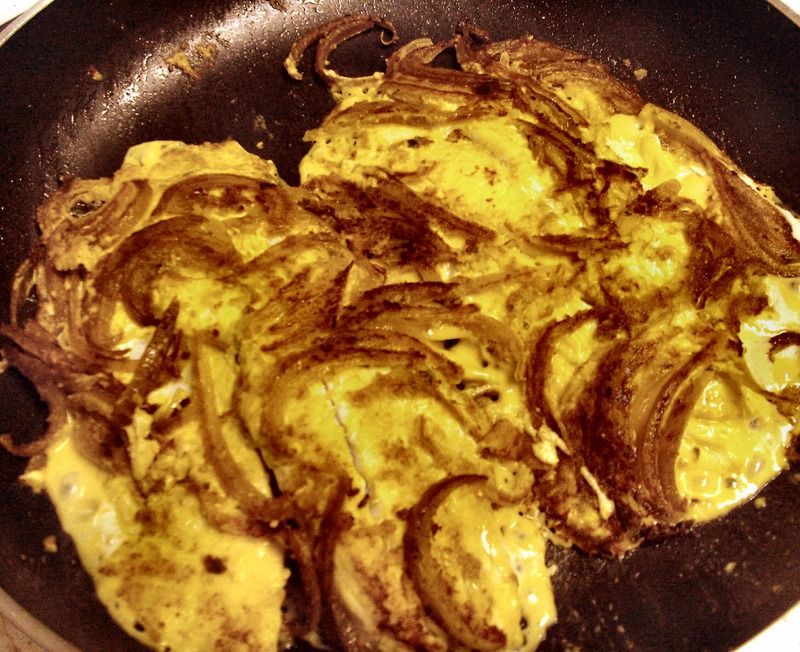 The fillets pick up a lattice of browned onions and curry spices when you flip them over. This is no great surprise if you like Middle Eastern food, I suppose, but tehina or sesame paste is not just for hummus, felafel and eggplant (or roast butternut squash, for fans of Yotam Ottolenghi). It’s also a great match for white-fleshed fishes such as sole, red snapper and tilapia, because it’s rich-tasting and smoky, goes really well with cumin-type spice combinations, and can be dressed up or down. But despite its richness (it is an oily paste like peanut butter, after all) it has very little saturated fat, mostly mono- and poly-unsaturated fats (the heart-healthy kinds) and it has enough flavor that a little goes a long way. So if you like fish and have a jar of tehina handy and some garlic (a must) and a few basic spices like cumin on your shelf, you can take advantage a couple of different ways without a lot of work. More often, though, I cook tilapia as a standard hot weeknight dinner. It’s relatively inexpensive for fish, lighter and much quicker to cook than chicken, can be served with dairy in kosher homes like mine, and it’s pretty adaptable. But as with skinless, boneless chicken breasts, it can get a little boring if you don’t do something new with it once in a while. One of the dishes I recall fondly and still miss from the Pita!Pita! Lebanese restaurant when it was still on Fair Oaks in Old Town Pasadena (must be something like 10 years ago now!) was sole fillets baked under tehina sauce. May Bsisu gives a recipe for two similar dishes (samak harra b’tehina and tagen al-samak) in The Arab Table, which I highly recommend. I think I mentioned this book in passing in a post about making your own yogurt in the microwave, but it really deserves more attention. Microwaved tofu platter in minutes, minus the big oil and salt overload of takeout. I’ve used snow peas and shiitake mushrooms this time, but you could use any greens you like and mix them up–bok choy, broccoli, green beans. Frozen snow or sugar snap peas work too. This is the recipe I meant to put in the last post about reducing sodium in Chinese food. Tofu is, as everyone knows by now, extremely versatile. It’s vegetarian, it’s shapeable, it’s mild but satisfying in flavor, it comes in a variety of textures and thicknesses, and it’s quick to cook–fried, steamed, stuffed, crumbled–or to eat cold. It’s also low-fat, low-sodium, nearly carb-free, and relatively high in protein, with some iron and calcium too. And it’s very inexpensive–less than $2 for a 14-oz. pad of tofu at the supermarket, about three or four servings’ worth. When it’s hideously hot out, as it was much of September here in Pasadena, you can marinate a sliced cold block of silken tofu by pouring a jao tze-style dipping sauce over it maybe half an hour, garnish with scallion shreds or crushed toasted nuts, and serve it as an appetizer. Or eat firm tofu plain and cold, if you like it. Or throw some tofu cubes into a salad with cabbage, lightly-steamed (or microwaved) fresh brussels sprouts, scallions and halved hard-boiled eggs, and drizzle peanut sauce over it. Or you can decide there’s no way you’re going to stand over a stove with a frying pan, but you’d like a proper cooked dinner that resembles kung pao or ma po tofu with some greens, just not doused in heavy greasy oversalted sauce or requiring a run to your local takeout, and it would be nice if it were very quick. Very quick. Like five minutes tops. And that it didn’t involve the stove at all. 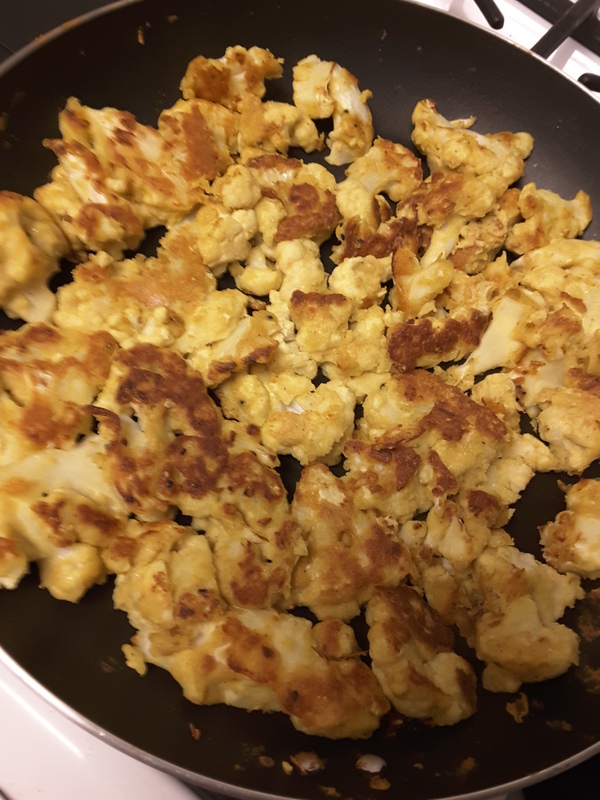 When my daughter decided she wanted to be vegetarian a couple of years ago, I discovered that you can “quick-press” tofu for Hunan tofu in about 4-5 minutes for a standard 14-19 oz. pad by cutting it up, standing the pieces on a microwaveable dinner plate, and microwaving, then draining off the liquid. Then it’s ready to stir-fry and it’ll brown decently. But I’ve done it so often in the past two years that my daughter’s kind of tired of it now (and has also gone back to eating fish and chicken once in a while). But we still like tofu. And with 100-degree days filling so much of September, there was just no way I was going to stand at the stove. So…. The entirely microwaveable tofu dish below is my daughter’s current preference, because the tofu cubes are softer, steamed in the microwave in a thin sauce rather than browned, and the scallions never scorch. And it’s not bad at all, and it takes, if not a literal 5 minutes, maybe about 10, start to finish. 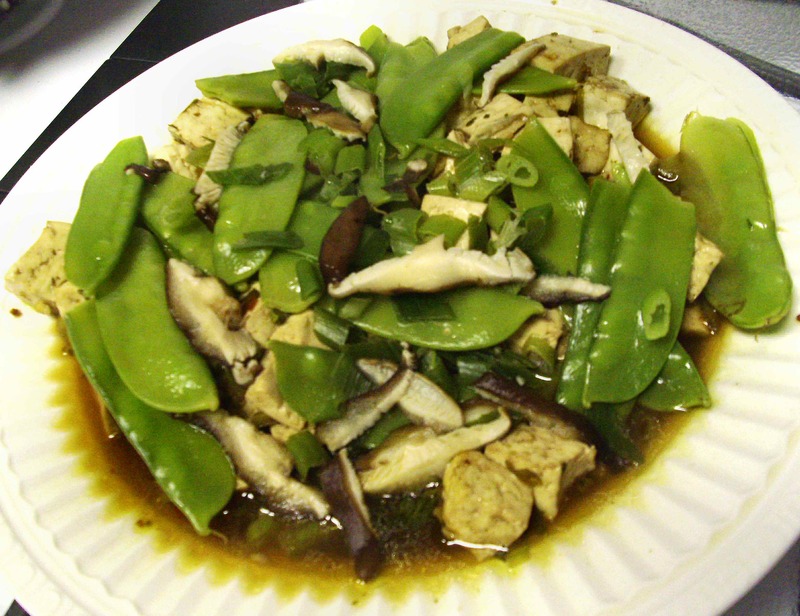 This tofu dish with snow peas and shiitake mushrooms uses low-sodium dipping sauce ingredients as its base rather than soy sauce or oyster sauce. It’s also microwaveable from start to finish and takes about 10 minutes total. If you have a big enough–and motivated–study population, even modest reductions in daily sodium intake can make a big difference in preventing strokes and heart attacks. Last month, cardiovascular researchers from Beijing and Sydney announced a new 5-year diet trial in Science to do just that (see the general overview article, “China tries to kick its salt habit”). China’s northern rural poor eat an estimated 12 grams of salt a day on average, considerably more than Americans’ 9 grams a day (which is still over the top) and more than twice the WHO’s recommended 5 grams or less. An estimated 54%, more than half, of Chinese adults over 45 have high blood pressure these days, and the Chinese government is taking practical steps to provide antihypertensive medications and shift the tide back–but that’s an awful lot of prescriptions. Given the cost of antihypertensive drugs for such a huge population, and the cost of dealing with side effects and consequences of untreated or undertreated high blood pressure, prevention seems the better way to go. The researchers project that reducing the national average by even 1 gram of salt a day would save 125,000 lives a year in China. So they’ve recruited 21,000 villagers so far in China and Tibet, and plan to provide test groups with nutrition counseling plus a lower-sodium salt substitute for cooking, then compare their sodium intakes and rates of heart attack and stroke with those for a control group. Most Chinese still do their own cooking at home, especially outside the big cities. If lowering the sodium content of the salt they use works, it has the potential to get an awful lot of people off daily hypertension medication and reverse a major health threat. But will people do it if they’re not in the trial, or once it ends? Will it catch on? And is it the right answer in the long run? Salt substitutes, with potassium chloride replacing some of the usual sodium chloride, have been tried by heart patients in the US since the 1970s or so. They’re a little more expensive than table salt or kosher flake salt, at least in the US, but they’re not all that expensive. But they’ve never really caught on here with most consumers. Similarly, a few decades ago, a big public health campaign in Japan to reduce the high rate of stroke led to the introduction of low-sodium soy sauces, with about half the sodium content per tablespoon of traditional ones. Not much market research is available on how many people have been buying low-sodium vs. regular soy sauce in Japan since its introduction. From the few current market reports I could find–one of them an executive report from Kikkoman–it looks like low-sodium is still a smaller if steady fraction of their business in Japan, and that it’s more popular in Europe and the US than at home. It’s important to have a low-sodium line for reasons of corporate responsibility and even prestige, but there was no mention of its percentage of total domestic or worldwide sales. Traditional soy sauces, which can range from 14-18% sodium concentration w/v, are still apparently preferred for taste, and the Kikkoman executives attribute much of their expected taste appeal to salt rather than the other flavors in each one’s profile. That’s kind of discouraging to me. The Japanese are known for more refined and sensitive palates on average than Americans, and their range of soy sauces and tamaris for specific food combinations is much broader and more sophisticated. The higher-quality low-sodium soy sauces are produced by ion filtration to get sodium out rather than simply diluting them with water, so most of the flavor that’s actually flavor remains. I would have hoped the key flavor signature of each match was the actual flavor of the brewed soy sauces, not the saltiness. It’s likely, though, that the Japanese are just as susceptible as the rest of the world to the sodium tolerance phenomenon–the more sodium you eat habitually each day, the more you expect and consider normal in your food, and you almost stop even noticing it as a separate flavor. The overall Chinese market for soy sauce is currently estimated at $20 billion and grew about 23.4 percent over the past 5 years, mostly due to population growth. The stakes are pretty high for China, but the government has tighter control of its salt and soy sauce producers than other countries do, and the will to make a broad change seems to be present, at least at a government level, and if the new study is anything to go by, among ordinary villagers as well. So maybe this time it will catch on once the study’s over. But obviously, if you’re starting out at a 12-gram-a-day salt habit, the best way to reduce sodium in home-cooked food would be to cut back hard on salt and salted items altogether. That takes time, practice, awareness and deciding that it’s worth going through that first couple of weeks until your palate readjusts to a lower-sodium diet (which it will, but it takes a couple of weeks and a little patience).